Lighthouse Reef is a dive site located at the northern end of Gili Lawa Laut which is off the north-east corner of Komodo Island. 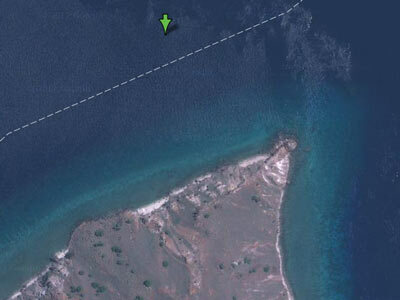 Gili Lawa Laut is about 2.5 by 1 kilometres in size. 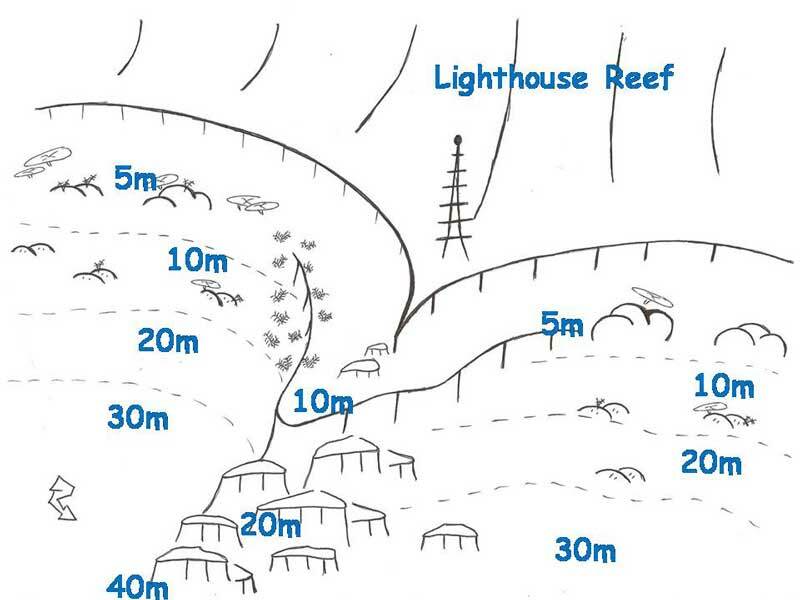 An approximate GPS mark for the dive spot is 8º 26' 22.3"S 119º 34' 51.3"E (using WGS84 as the datum). The site is to the south-east from the GPS mark. The actual site is located around the point where the lighthouse can be seen (apparently it does not work nor has it done so for over 10 years). The method of diving the site will depend on the flow of the current. 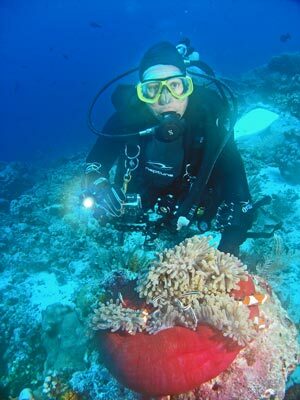 As with virtually all dive sites that you do when on MV Mermaid II, you use the RIB (rigid inflatable boat) to get to the start of the dive (and also to get back to the boat). The RIB will drop you normally a few hundred metres to the south of the lighthouse. 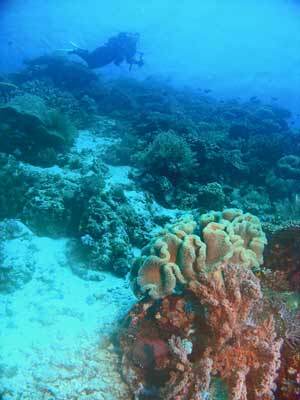 The reef top here is about five metres and the bottom is sand that slopes to about 30-40 metres at least. Once in the water, we drop to 16 metres and then work our way to about 24 metres. There is a reasonable current running from the south, so we drift north. There are some huge gorgonias deeper and smaller ones shallower. There are lots of sea whips and small barrel sponges all over the site. The bottom has small outcrops of coral interspersed with sand. 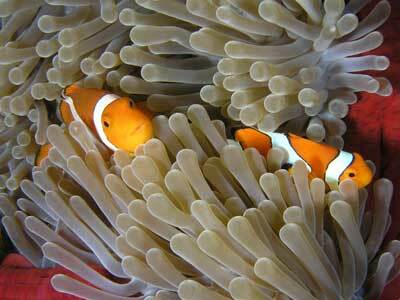 There are two lots of clown anemonefish (Nemos) as well as other clownfish. 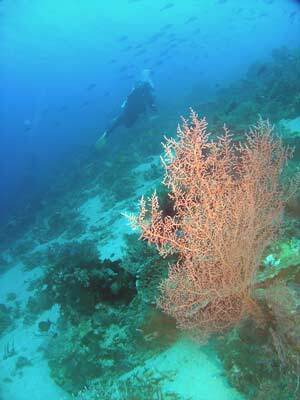 As we approach the point, the bottom has less coral and there are more hydroids. 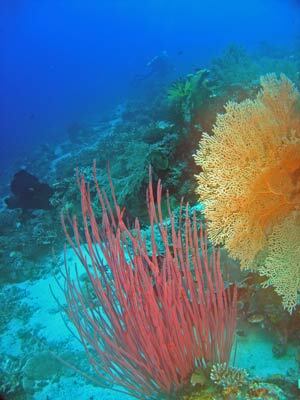 Lots of care needs to be taken in this area when taking photographs as you can easily rub up against the hydroids and get stung (like I did - bugger). We had ascended to about 15 to 18 metres for most of the drift. As we neared the corner (40 minutes into the dive) the current increased a bit. at the point there are are a series of steps going down to over 40 metres. The current pushes us down and I go from 16 metres to 28 metres in a few minutes as we whip around the corner. At the corner there are dozens of large batfish and giant trevallies. This was quite spectacular. Around the corner we see a number of sharks, including one asleep on the bottom. We are now heading west and we start our ascent from 28 metres. Over the next 10 minutes we gradually ascend to five metres. 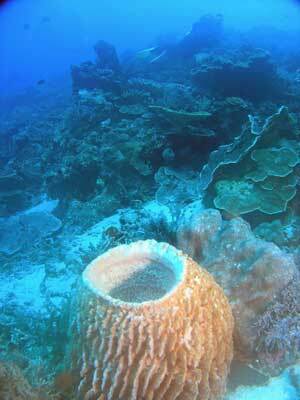 Back in closer to the island in the shallows there are lots of larger coral bommies. We spend the final 20 minutes exploring this area. There is plenty to see, including nudibranchs and moray eels. This was a very good dive. The visibility was probably 40 metres and the water temperature was about 27ºC. Click here to return to see the dive profile from my computer.